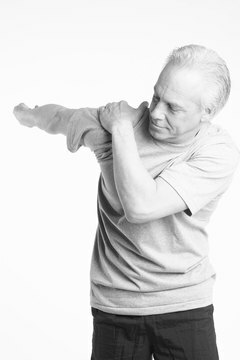 Exercise your arms and shoulders to minimize injury and to increase range of motion for a better golf swing. Toned arms and shoulders are not only visually pleasing but also stronger and able to withstand greater amounts of stress without injury. Working the deltoids, rotators, biceps and triceps will enable you to lift, hold and carry greater weight safely and will enhance your overall athletic performance as well as your golf swing. The following exercises can help you to develop upper body strength while improving the physical condition of your shoulders and arms. 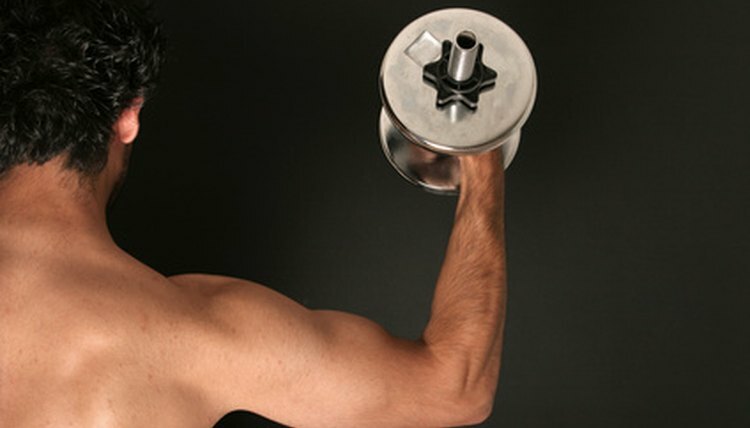 This is perhaps the most common arm exercise for increasing strength in the biceps. Hold a dumbbell in each hand. If you don’t have dumbbells, substitute two objects of equal weight that are easy to hold, such as bottles of water or cans of soup. Stand with your feet apart, distributing your weight equally between them. Turn your arms so your wrists face up. Bring your right arm up toward your right shoulder, and then slowly lower it. Repeat with the left arm. If you are a beginner, complete one set of eight repetitions with each arm. When you can do eight easily, add an additional set of eight repetitions for a total of 16, or increase the weight in your hands. Pushups tone rotator cuff and deltoid muscles. This push-up style exercise rests most of the weight on the forearms. It works to tone rotator cuff muscles and deltoids. It also gives your abdominal muscles a workout. Begin by lying on your stomach. Place your hands flat on the floor and position them near your ears. Make sure your feet are touching each other. Take a deep breath and push your body up, keeping your elbows on the floor. This will place your weight onto your forearms and toes. 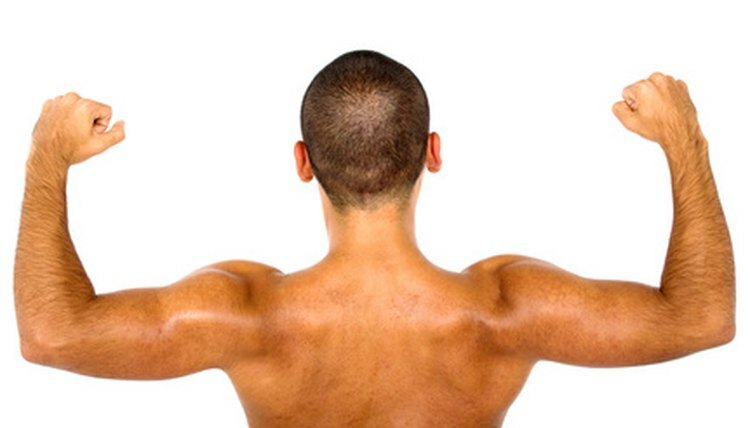 If you’re positioned correctly, your elbows will be directly below your shoulders. Hold your body as straight as you can, trying not to sag in the middle. Hold this position for 30 seconds. When you can easily do 30, you should try for 60 seconds. And when you can maintain this pose for 60 seconds, try holding it for 90, and so on. Triceps can be excercised with dips. Improve the condition of your triceps by "dipping." Begin by sitting on the edge of a chair. Place your hands next to your thighs and your feet flat on the floor in front of you. Grab the edge of the chair and scoot off the end of the seat. Bend your elbows and lower your body toward the floor. Pull your arms straight and bring yourself back to the starting position. Repeat this exercise eight times. Using a book to exercise shoulders. To improve the overall condition of your shoulders, pick up a heavy book. Standing an arm’s length away from the wall, extend your arms and hold the book flat against the wall. Keeping your feet in place, use your arms to trace with the book the shape of each letter of the alphabet on the surface of the wall. When you can do all 26, try to hold the book in one hand and then the other, rather than using both.